Today we returned to Victoria from Narooma in NSW. We took the Pacific Highway and not too far out of Bega turned right onto the Snowy Mountains Highway before turning South on the Monaro Highway and crossing into Victoria with the Park on the left hand side of the road. 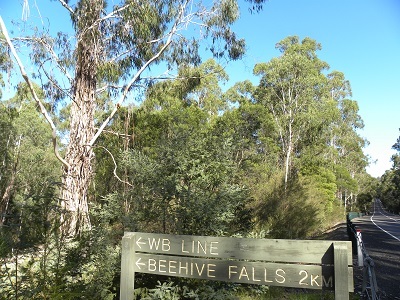 Not too far into Victoria we saw a sign giving access into the Park and indicating Beehive Falls about two kilometres further on. I found a good spot complete with picnic tables and no other homo sapiens. VK3PF, Peter, who has activated the Park twice recommended this spot. We had it to ourselves. I set up and 23 contacts later packed up. I was really pleased with the activation. I used a new to me, but pre-loved Yaesu 897D, running about ten watts. I purchased this radio from a deceased estate in Sydney after seeing an advertisement in Amateur Radio Magazine for December/January. My son collected it about three weeks ago and this was the first time I had a chance to put it on the air. It will be used in the longer term at slightly higher power, say 30 to 40 watts, to give me a better chance of working DX from parks and giving chasers a better chance of hearing me from remote locations. I need to investigate a battery capable of supplying a higher current draw for a longer period if time, but still remaining ‘portable’. I will study the blogs of other amateurs to see what they use when using their FT897Ds on higher power in the field. Here are my contacts: beginning at 02:16, VK3YY/P3, Glenn on VK3 VT 026; VK3MTB, Tim; VK3JNI/P, Tim at the Lakes National Park; VK3RAN, Tony; VK3PF/P3, Peter on VK3 VE 056; VK2IB/P3, Bernard also on VK3 VE 056; VK3FQSO, Amanda; VK3ZPF, Peter; VK2CCJ, Cliff; VK3ZPF, Peter; VK3BHR, Phil; VK3JD, John; AX2UH, Andrew; VK3MRG/P3, Marshall on VK3 VN 017; VK5PAS, Paul; AX2UH, Andrew; VK3FB/P3, Len; VK3TKK, Peter; VK3HRA, Allan; VK3ANL/P3, Nick on VK3 VE 039, The Hump, at Mount Buffalo National Park; VK3MRO, Tibor; VK2LAX, Rod and at 03:10, AX2CL/P2, operator Raffy at Club Station on Bear Island.